“Please note that we are managing the situation with regards to the hurricane in Costa Rica and we…” wait, WHAT? A HURRICANE? Nope. This update was not what we had expected from our travel agents the day before we were to fly out and it set our nerves in motion just a little. Were we boarding a flying titanic? Was this it? The end of the high and mighty me? Hordes of weeping peasants lining our funeral procession as balloons with Pippa’s and my face float off in the sky? Well, not quiiiite. 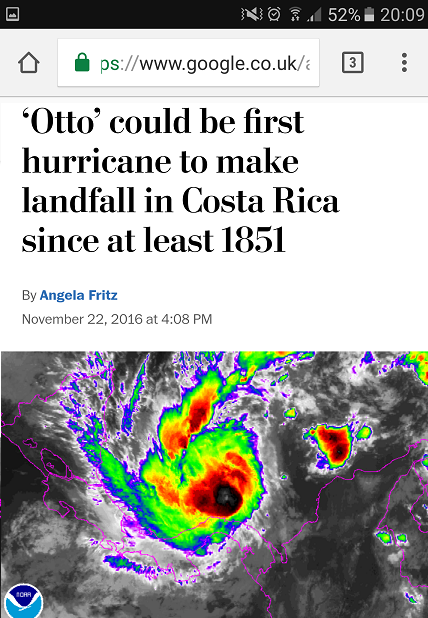 Actually, despite landing exactly as hurricane Otto hit Costa Rica AND an earthquake struck off its coast, it was a very smooth landing. My eulogy will have to wait. 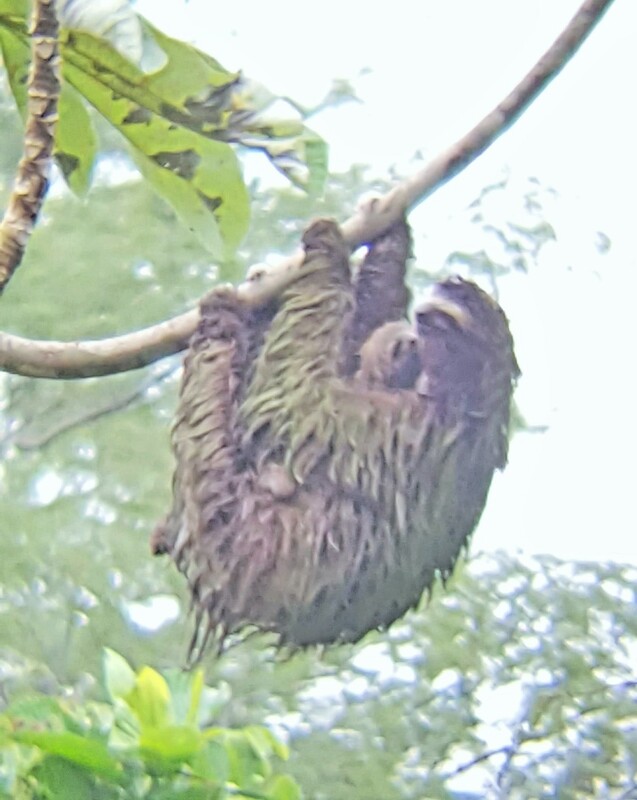 However, it did set the tone for two mixed weeks in Costa Rica: the awe and joy at spotting rare endemic animals; the frustration at near constant heavy rain and cancelled plans; the exhilaration at watching a drenched sloth feed with her baby; the fright of only marginally avoiding walking into the most deadly of Costa Rican snake or being evacuated from a national park with lightning overhead; the anger at the constant rip off prices tourists get charged (e.g. $50 for a 10 minute taxi ride…); or the delight at bumping into an old schoolfriend I hadn’t seen in 12 years in a small restaurant in a small central town to name but a few. 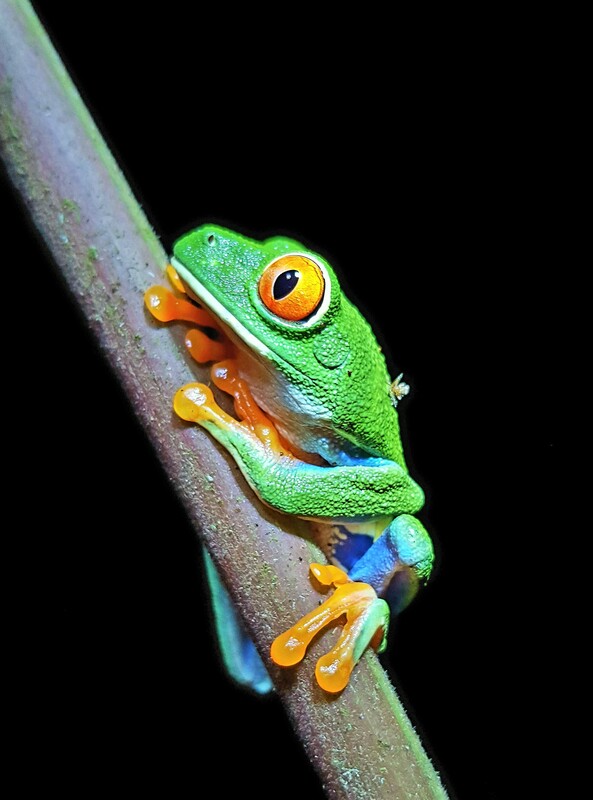 It’s hard to be negative about Costa Rica. It’s a beautiful country: the wildlife is unique and, I’m told, the views beautiful too (seriously, we could have been in the Scottish Borders in January at times). We were just unlucky and wish all other travellers better luck! 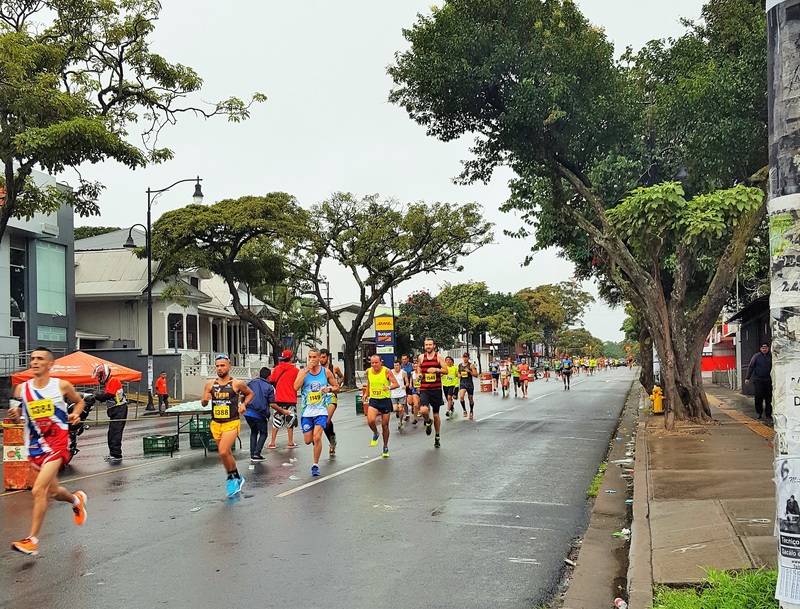 Towards the end of the holiday, we had planned a stop-off in the capital San Jose for the Costa Rica half marathon. 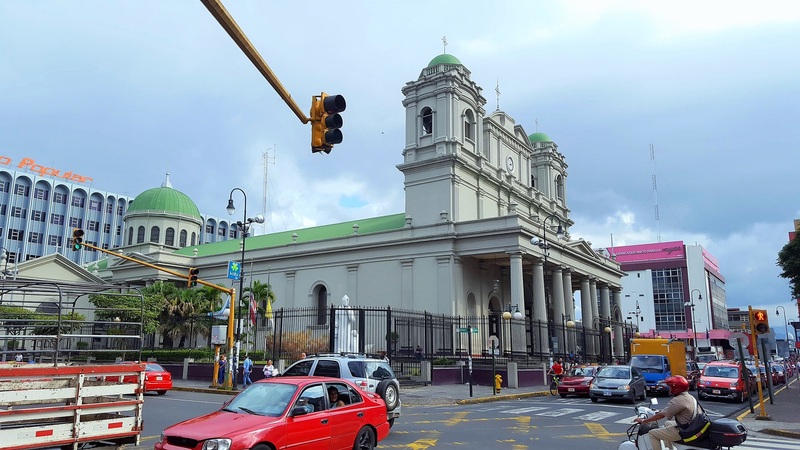 San Jose, in our opinion, was nowhere near the hellhole many travellers describe it as. 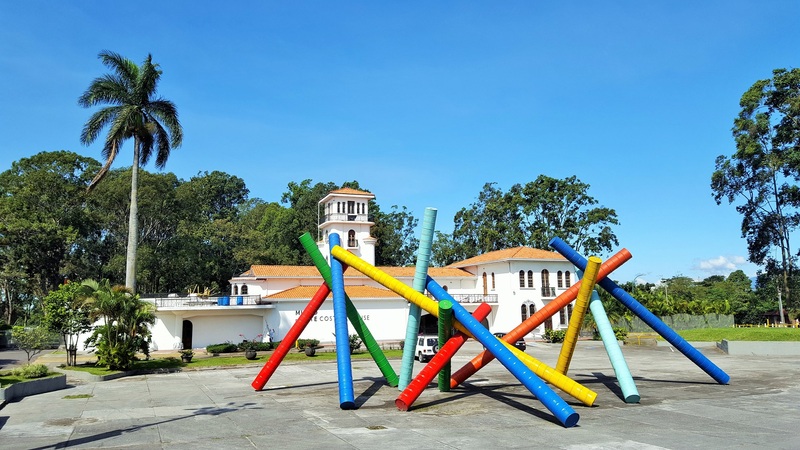 Granted, downtown roads and pavements were gridlocked in rush hour and it pales in comparison to what else can be found in the country, but we found the La Sabana Park near our hotel very pleasant, the museums sufficiently interesting and the amenities good. It’s always warm but never too hot (e.g. most homes here have neither heating nor cooling systems) AND we found the only cheap thing in the country here: uber! £3 for a 15 minute journey. Yes please. Back to the race then. 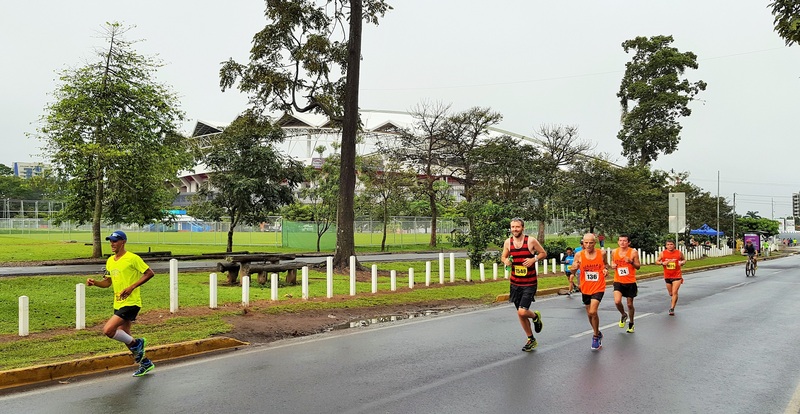 The Costa Rica marathon day has 4 races: 4k, 8k, half and full marathon. I’m not too sure what the shorter races’ courses were but the marathon is two times the half marathon course so I only did the latter as I was somewhat nonplussed about twice doing a course which was already made up of loops. 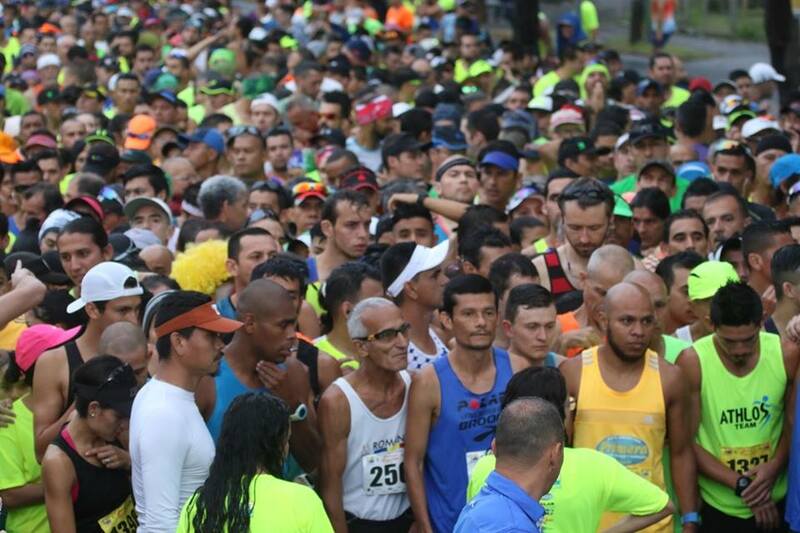 The races start at the national stadium on the west side of the city before heading out east along Avenue 2 for 5km. Once you reach the Democracy and Abolition Park, you turned back on yourself and do two large loops of La Sabana Park and surroundings. Simple really. On the downside, this race is not for night owls. Scheduled for a 6am start (to avoid the heat), it meant I had to wake up at 4.30am, far far far before anyone should ever be allowed to wake up. Our hotel was a short 10 minute jog from the start line so I only left the room 45 minutes before the race started which felt odd! It also meant I had less time than normal to digest my breakfast, which would come back to bite me later! I got to the start just as 20 burly men were lifting the inflatable archway over the road. With less than half an hour to go, this seemed a bit late in my mind but hey, I suppose it worked! I still had enough time to utter the most important Spanish sentence ever before a race: “¿Dónde están los baños?” Some pigeon English later and I was jumping a barrier into a VIP section as I clearly wasn’t the only one needing the baños and, erm, I didn’t want to wait. 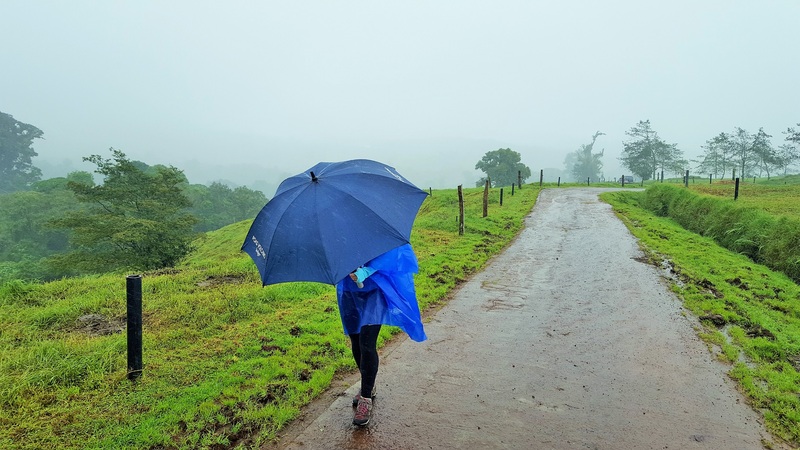 With that business done, I was back at the start line just in time for a huge downpour (it wouldn’t have been Costa Rica without it) and to sing along to the national anthem (or not). Like in most races, I tend to stand out height-wise. However, this reached unprecedented levels here: at 1m96, I’m a full 30cm (1 foot) higher than the average Tico and 40cm the average Tica! Very good for him but … maybe shouldn’t have started right in front of elite? Anyway, a few minutes late and the gun finally went off. 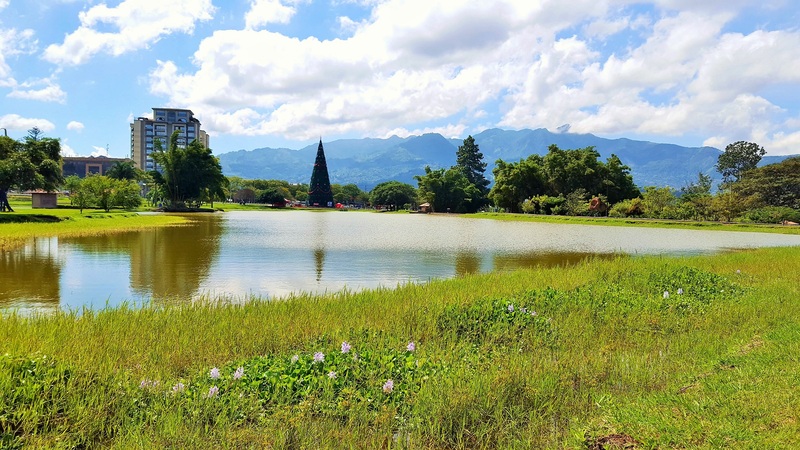 The previous day, we had walked around La Sabana Park to pick up my bib (which, amusingly, coincided with a Cosplay conference – quite the scene…!) and had commented on how reassuringly flat it was. Well, we were wrong. Somehow, we’d missed the fact that the whole park and surroundings were on a very long incline. After 200 seemingly flat out metres, I was still only averaging just under 4min/km which was slow for the start of a race. 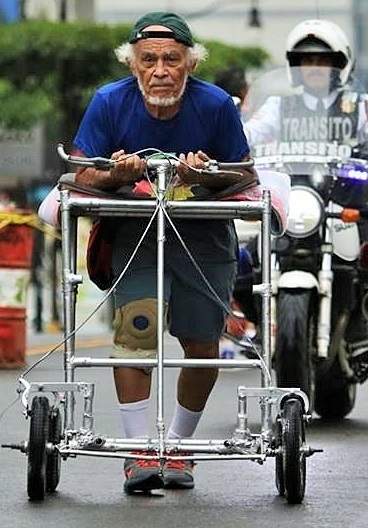 We might have overtaken the wheelchair racers by then (one of whom had the strangest ever contraption – see photo, and probably shouldn’t have been starting ahead of the runners but good for him for racing) but I had already reset my race expectations once it dawned on me that this course wouldn’t be quite as pancake-like as hoped. The whole course was clearly far from being as mountainous as the rest of the country (which truly is steep) but you were pretty much going up a steady, slow incline for half a kilometre, then down for half, then up for 2, then down for 1 etc for the whole course. Within a kilometre or so, the groups settled: some people sped off in the lead and I hid in the middle of the secondary pack. 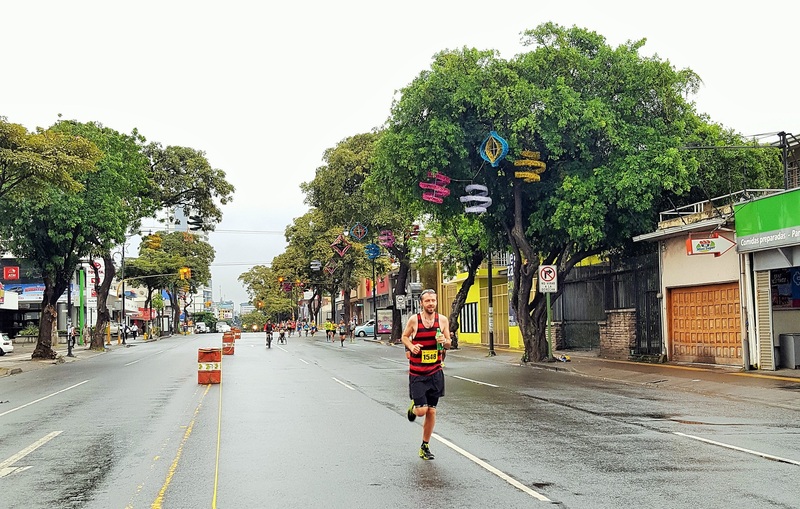 After a few kilometres, we ran past a car which had been abandoned in the night in the middle of the course after it had clearly tried to drive through the course and gone straight into one of the big oil drums lining the course. Oops. On a similar note, Pippa was worried for my safety throughout as she saw loads of cars just driving up and down the course but I never noticed any real danger. Sights were relatively scarce: a church here, a cathedral there, a park in between. There wasn’t really much to be awed by, other maybe than the sheer number of McDonald’s restaurants and the Christmas decorations. Even by UK standards, they really like their Christmas here – decorations were everywhere, each trying to outdo one-another. 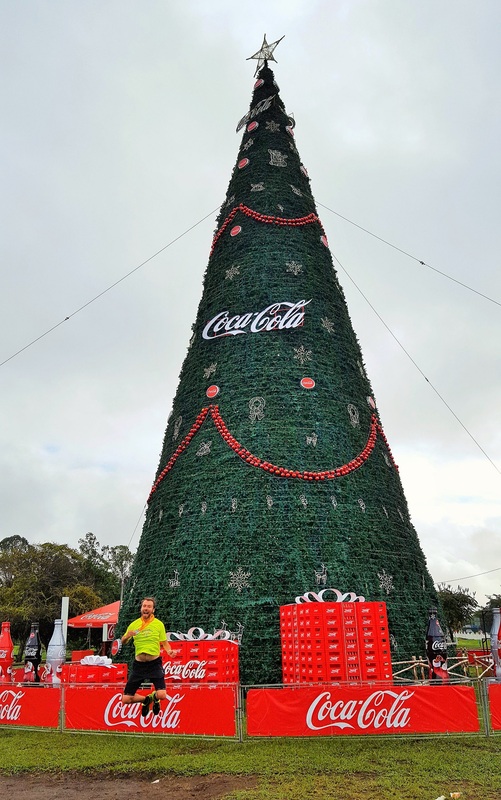 The biggest – scariest – of all was the Coca-Cola Christmas tree in La Sabana Park – at a rough estimate, it was at least 20 metres high, or 12 Pippas high, as per the photo. 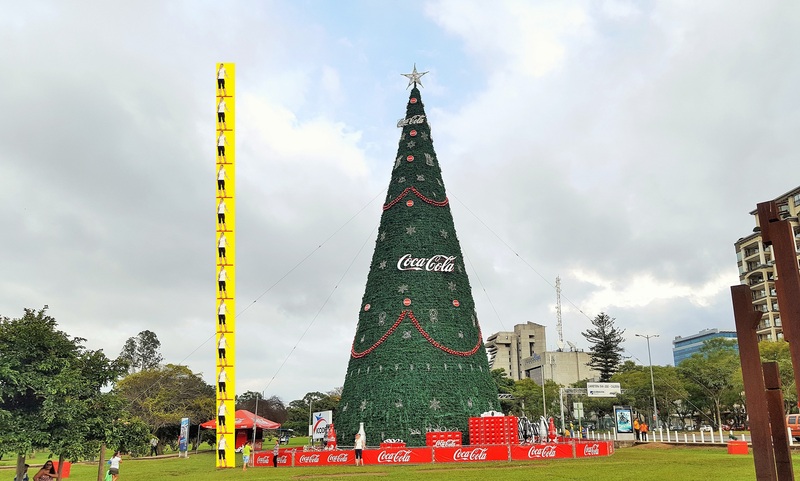 Costa Ricans like their Christmas celebrations! Although I felt like I was going slowly, I felt on fire when I went through the 10km mark in a quite staggering 36 and a half minutes. That my watch indicated 8.5km is another matter – at that point, I was theoretically on track to blow my PB by a full 4 minutes. That didn’t last long, as they’d clearly just marked the mileage wrong at that point. Overall however to be fair, the course was reasonably well organised, save for a few encroaching cars and inaccurate markings: it was well marked and had water stations every couple of kilometres and a clear start/finishing area. I had my own water anyway due to my risk-averse worrier nature so ended up just emptying their water over my head every time I went by to mitigate the effect of the town’s humidity. By the end, I’d actually tipped so much over me that my shorts, which I had forgotten to knot, kept creeping down towards my knees. Oops again! After 11km or so, shortly after being overtaken by the lead female marathon runner, it was my turn for glory as I overtook…a one-legged runner who (I bloody hope) had been doing one of the shorter races. After that, we started the painful 3km climb back to the stadium for the first of two times. It was far from hellish but far from pleasant too, in particular as my niggling hamstring was constantly screaming back at me. Around now, my hastily scoffed 5.15am banana was also coming back to haunt me and my guts. Thankfully, Pippa was at the top of the hill to cheer me on and put a smile on my face. She’s normally not the easiest to spot but, on a drizzly Sunday morning at 7am, it’s fair to say the crowds weren’t that thick! 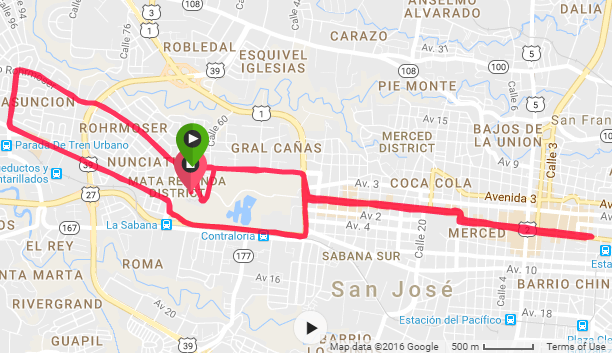 To finish off, it was another 7km around the same loop around La Sabana park. The downhill was nice, the uphill less so! Overall, it was far from my best race. I’m not too sure why, although I’ve come up with plenty of excuses other than ‘my fault’: a general lack of motivation, higher altitude, hills, limited food the day before, early rise, buggered hamstring, wrong shoes, lack of training for the previous two weeks. Really, it was anyone’s fault but mine. Bearing that in mind, the last few kilometres up that hill were a bit of a slog. 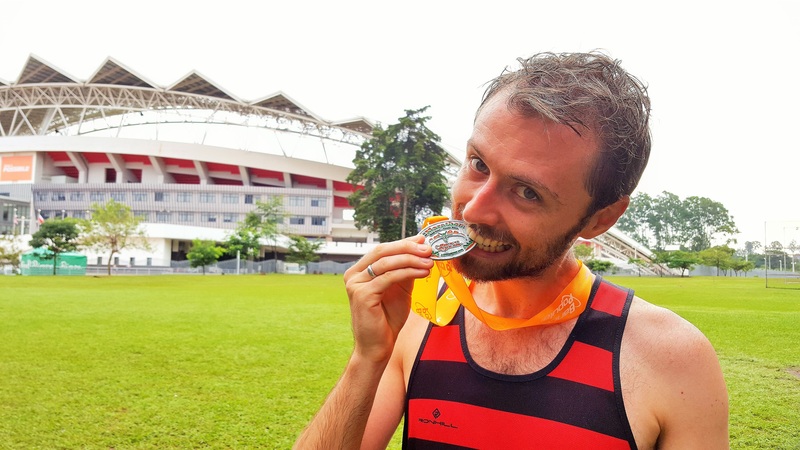 Eventually, we got back to the brand new national stadium and completed one lap in front of a fairly empty crowd (once again, 7am on Sunday … let’s be fair!). My only motivation at that point was to get in under 1h30 which was pretty much a normal training pace. With one last sprint, I nipped under with 10 seconds to go. And, with that, we headed back to the hotel for breakfast and a lie-in: a totally normal Sunday morning (with a twist).